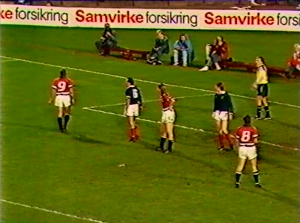 Norway and Scotland had been given the honour of opening Group 5 with this clash in Oslo. The Scottish were setting their sights on a fourth straight World Cup participation, whereas Norway would be hoping that they could challenge for glory this time around. Operating with a part-time domestic league, they needed to rely on professionals abroad to raise their level. They had it in them to give anyone a match on their day, so it was up to the Scots to make sure that they did not fall into the trap of underestimating their opponents. 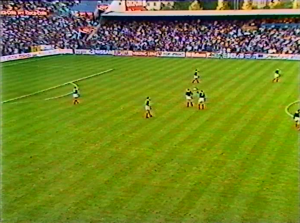 Ullevål Stadion was the venue, and the Norwegians needed to improve on their previous qualification home record, which read 1-1-2 from four matches in their futile attempt at reaching the European Championships in 1988. In the same qualification, Scotland had only lost one of their four away matches. Having seen Ingvar Stadheim replace the ill-fated reign of former national team manager Tord Grip, a Swede who had failed to deliever much in terms of excitement both in the way his team had played and through his character, there appeared to be something of an optimistic air blowing through Norwegian football. The draw against the Brazil Olympic select in July, Stadheim's first game in charge, had been a lively affair, and they'd followed that up with a similar outcome at home to a decent Bulgarian outfit. Now it was time to put rehearsal into practice, as they needed to build on the impetus which the change in regime had brought about. Ten of the 13 players who had been in action against Brazil were still in the squad, whilst all 13 who had played their part during the 1-1 tie with Bulgaria remained. Stadheim had seemed to prefer a settled side rather than looking to make plenty of changes during the two first matches of his tenure, and it looked likely that a line-up relatively identical to what he'd displayed earlier could be expected once again. One player who had returned to the squad after being a non-feature against Brazil and Bulgaria, though, was full-back Hans Hermann Henriksen. The 30 year old was based in France, where he was a feature for second tier club Abbeville. No longer an international was another full-back, Denmark based Erik Solér, and so the inclusion of Henriksen made sense. Solér had played in the Brazil game. The five defenders in Stadheim's squad had four players plying their trade abroad, of which no less than three were operating in the West German Bundesliga: central-defenders Erland Johnsen and Rune Bratseth, as well as left-sided defender Anders Giske. Only Lillestrøm's Gunnar Halle was still playing domestically. Five or six players were midfielders, and the manager's central two appeared to be pre-destined: Sverre Brandhaug of Rosenborg, domestic title winners in the making, and Tom Sundby, who was a feature with Iraklis in the Greek top flight. There was also the exciting Karl-Petter Løken, another Rosenborg man, who was a speedy right-sided player. Further options in the centre were Sweden based Kjetil Osvold and Ørjan Berg, the latter a 20 year young Rosenborg player. For either a wide role or a place up front there was Jahn-Ivar 'Mini' Jakobsen, one of six individuals from Trondheim club Rosenborg in the squad. He'd earned his nickname due to his size, or rather the lack of: He was 5'6 tall. The manager had three strikers available to him, in addition to 'Mini'. They were Jørn Andersen, another player based in West Germany, the up and coming Jan Åge Fjørtoft of Lillestøm, as well as Gøran Sørloth (Rosenborg). The latter was 26, and appeared to be something of a late bloomer, only featuring at full international level since recently, having previously been part of the Norwegian Olympic team set-up. In Norway, though, Olympic football was still considered 'full international level', and so matches for this team feature in a player's international records. The new national team boss had been using the squad's leading cap Erik Thorstvedt between the sticks for both of his previous matches. The Sweden based 25 year old would win his 47th international if selected today. Supposed back-up choice was 29 year old Rosenborg stopper Ola By Rise, himself on 16 caps. Andy Roxburgh would lead the Scottish team in a qualification for the second time, and though they had only lost twice in the qualification for the 1988 European Championships, they'd finished fourth among the five participating teams in their group. A tremendous 1-0 win away to Bulgaria in their penultimate match had paved way for the Republic of Ireland as participants in the final, but a 0-0 draw in Luxembourg in their final fixture had prevented Scotland from jumping above Belgium in the final table. They'd been dealt a tricky opening fixture, and Roxburgh would see his assistant Craig Brown manage the first half from the dug-out while he himself was sat in the VIP lounge. Scotland had not been in action since the Rous Cup back in May, when they'd lost to England in London after a goalless home draw with Colombia. Since then, there'd hardly been a big change-around in players, and the two most notable absentees from the 1-0 loss at Wembley were central-defender Richard Gough and striker Ally McCoist, both Rangers players. The latter was missing three successive league matches around this time, and so he was most likely injured, whereas Gough was still featuring domestically, so his no-show would've had other reasons. In Roxburgh's 16 man strong matchday squad, he had goalkeepers Jim Leighton and Andy Goram, representing Manchester United and Hibernian respectively. The former, who had departed the Scottish scene in order to play for English sleeping giants United, appeared to be an obvious first choice, with the 24 year old Goram so far only having four internationals to his name. Leighton's appearance number, 44, was only surpassed by that of the two experienced central-defenders Willie Miller and Alex McLeish, former team mates of his at Aberdeen. The Scots had some strong, imposing defenders available to them. Said Aberdeen duo were hoping to make out the backbone of the team, though they'd face stiff competition by Liverpool's Gary Gillespie. The 28 year old had arrived late on the international stage, and would win his only fourth cap should he appear in Oslo. Another big, uncompromising defender, another asset of his was versatility, something which could bode well considering the competition he faced. His team mate at Liverpool, Steve Nicol, was another likely starting candidate, though he too was someone who could be deployed in a number of different positions, so it remained to be seen where they'd fit in, if anywhere in the starting line-up. There were also experienced Dundee United men David Narey and Maurice Malpas to chose from. Celtic duo Paul McStay and hard man Roy Aitken appeared candidates for two of the midfield positions. They were both among Mr Roxburgh's favourites, although they'd face competition for the central roles from Ian Durrant, across the city in Glasgow with Rangers, and West Germany based Murdo MacLeod. They appeared to be very well equipped in the engine room. Further candidates were Dundee United's exciting youngster Kevin Gallacher, who could play out wide or even up top, and also possibly the already mentioned Nicol. Three or four players were candidates for the two centre-forward roles, and it would be interesting to see whether the player who'd taken English football by storm the previous season, Brian McClair, whose move from Celtic to Manchester United had been an inspired one, as he'd turned out to be the first striker in the famous red and white at Old Trafford to score more than 20 league goals in a season for 20 years. Experienced Everton striker Graeme Sharp, one of four based in the English top flight among the 16 Scots in the matchday squad, was another candidate, whilst the only continental legionnaire, formerly a team mate of McClair's at Celtic, now at French top flight club Nantes, Mo Johnston, could easily also blend in. Scotland were, much like their hosts, considered a typical 4-4-2 team. An Italian signore by the name of Luigi Agnolin, aged 45, was in charge of the tie. He was a truly experienced gentleman, and he'd officiated during the 1986 World Cup, where he'd overseen two matches: The group stage fixture between the Soviet Union and Hungary (6-0) and the semi-final between France and West Germany (0-2), no less. He also had six previous qualifiers on his CV, both for the 1980 Olympics, the 1984 European Championships as well as for the 1986 World Cup. 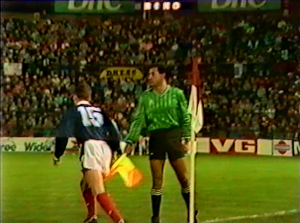 This was Mr Agnolin's 18th international as a referee, and it was his third time refereeing a game with Scotland. He'd done so only the previous year, when the Scots had succumbed to Brazil (2-0) in the 1987 version of the Rous Cup. No less than seven Scotsmen remained from the 13 who had been on the pitch during that game. He'd also been the man in black for their 2-0 friendly defeat in France back in '84, and a total of five names were still present in the Scottish squad from that fixture: Leighton, Miller, McLeish, Malpas and Johnston. 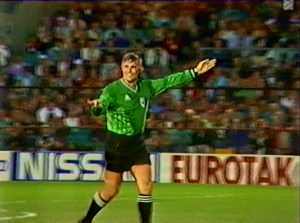 Agnolin had never before refereed a match for Norway. This was the eighth ever meeting between the two countries. They had met in qualification for the 1980 European Championships, and Scotland had won both home and away. Indeed, their 4-0 win in Oslo in that qualification, in June 1979, had been the two countries' last encounter. No player still remained from either side. The overall record read 5-1-1 in favour of the Scots, with Norway's only win coming in a 1963 friendly in Bergen by four goals to three. It is worth noting that Sundby lasted less than a minute before going down with a serious knee injury. When Ørjan Berg replaced him, it led to the substitute taking over the left-sided midfield role, with Osvold coming into the centre to fill in for Sundby alongside Brandhaug. The two teams had taken to the field under the Oslo medio September sky, and the atmosphere inside the compact Ullevål Stadion appeared charged. Despite Norway's constant existence among the lower-ranked European nations, football had remained the number one sports in the country, and now, at the inauguration of yet another World Cup qualification, the just shy of 23 000 strong crowd wanted to play their part. With English football always so popular in the Scandinavian countries, most of these players would've been known to the stadium audience. For the hosts, there did not seem to be any great surprise inclusions. The manager had found space for up and coming Lillestrøm striker Jan Åge Fjørtoft next to domestic profile Gøran Sørloth as the hosts' attacking duo, and there had been a recall to the right-back berth for France based Hans Hermann Henriksen. In the visitors' camp there was a lot of experience, particularly throughout the core of the team, with the seasoned Aberdeen stoppers lining up together. However, could their line-up see a five man defence, as there was Liverpool central defender Gary Gillespie involved as well? Former Celtic strikers Brian McClair and Mo Johnston would renew their acquaintance in tandem up front. 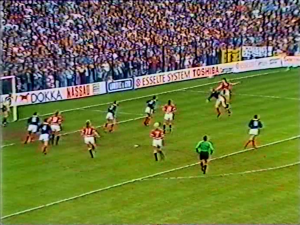 Scotland would commence the game, and they would be attacking from left to right as the cameras were looking. There's no picture exactly of the kick-off moment, but it is likely that the two strikers would've been pairing up to get Group 5 under way. 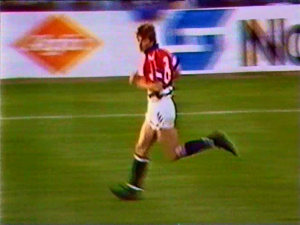 The game is less than a minute old when Norway's midfield general, Greece based Tom Sundby, appearing for the 39th time in the national team jersey, is tackled on the fringes of the centre circle inside the Scottish half. The tackle does not appear to be of any malice; in fact, it looks relatively harmless. However, the 27 year old Sundby goes to ground and stays down, clearly in a lot of pain. He is left clutching his right knee, and though it is difficult to spot through replays, he must have twisted his knee badly as he rotated and went down in the wake of the challenge from Scotland's Steve Nicol. Nicol gives the floored Sundby a couple of friendly pats on the back. The Norwegian medical team attends to the player, who is then assisted off the pitch by striker Fjørtoft and a member of the medical staff. Sundby had been on the ground for two minutes. He had hardly even had time to touch the ball before the incident occured, and now Norway needed to bring on 20 year young Rosenborg midfielder Ørjan Berg for only his second international appearance. This would've been a major blow to the hosts, and the Norwegian players had surrounded Sundby as he had been on the ground receiving treatment. There were worried looks on several faces. They must have realized their team mate's agony. Posterity shows that he would never again appear for his country. He would be facing a lengthy recovery for what turned out to be a cruciate ligament injury to his right knee, and this also spelt the end of his Greek adventure. Sundby would only return to playing domestically, in the top flight for Oslo club Lyn, in the 1990 season. Immediately in the wake of Sundby's injury, the Norwegians do not seem to be affected. They seize control of proceedings, and they pin the visitors back. The hosts' main weapons are set-pieces, where they aim for the gigantic Rune Bratseth, the West Germany based central defender, who always comes forward to try and win headers and direct the ball into the path of a team mate, and also the highly energetic Karl-Petter Løken along their right hand side. Løken, 22 years of age and featuring only in his sixth international, appears to have a spring in his step, and whenever he is played down the right hand side, he poses a threat to Maurice Malpas, who is the Scottish left-sided defender. Their tussles will prove to be among the more interesting battles on the pitch for large parts of the game. Traditionally, it would be fine guess work that any British team would be dominant in the air, and the Scottish do have some strong defenders of fine aerial reputation, first and foremost in Gary Gillespie. However, even the sturdy Liverpool man falls short to Bratseth from a Løken delievery into the area five minutes into the game. 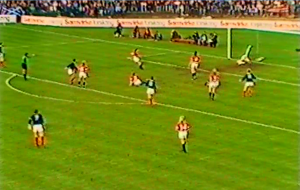 Visiting goalkeeper Jim Leighton can draw a sigh of relief when Bratseth fails to connect properly with the ball, and the Werder Bremen man's header goes well over from close range. 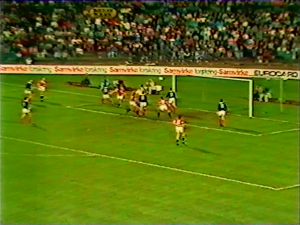 Two and a half minutes later, there's another goal attempt from the hosts, when Bratseth this time has defeated Alex McLeish in the air from Norway captain Anders Giske's free-kick into the penalty area. On this occasion Gillespie makes sure to close Jan Åge Fjørtoft down, and the lively striker is unable to aim his low first time attempt on target, missing to the right by a few yards even. There's fine pace to the game, with Norway setting the tone. Scotland have so far only had a cross from the right hand side through Kevin Gallacher to show for, but the young Dundee United forward could only direct it straight into the expecting arms of goalkeeper Erik Thorstvedt. The visitors do attempt something akin to pressure high up in the pitch, but it is not a truly collective effort, and they do not manage to unsettle the Norwegian defenders. Norway midfield man Sverre Brandhaug proceeded to release Fjørtoft with a through ball on eight minutes, but the visiting defensive line had made sure to push up in time, and so the young and enthusiastic striker had been played offside. He still went on to round Leighton and put the ball into an empty net, claiming he'd not heard the whistle. No booking, even if Mr Agnolin did not seem best pleased. 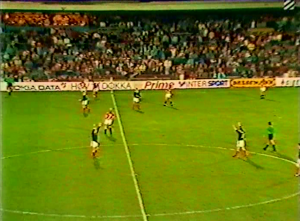 The Scots have not had much to shout about early in the game, but there had been signs that they were growing into the contest during the last three or four minutes when they all of a sudden take the lead courtesy of midfield man Paul McStay's sixth international goal. 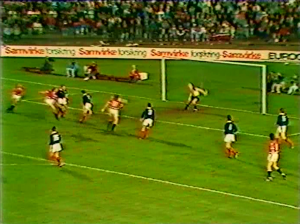 The goal had a fairly simple recipe, with veteran central defender Willie Miller in possession in the centre circle aiming a ball high into the area, where Mo Johnston appears to take Bratseth by surprise. In normal circumstances, it is likely that the defender would defeat the France based forward in the air, but on this occasion Johnston had snuck in behind the big defender and jumped early enough to get his head to the ball. It was directed slightly backwards in the area, where Brian McClair was approaching. However, he would collide with Norway's other central defender Erland Johnsen, and they'd both take a tumble and go to the ground. 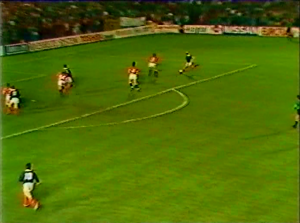 The ball would spin free towards the edge of the area, where midfielder McStay would arrive and hit a first time drive low with his left foot. It seemed to catch 'keeper Thorstvedt resting on his 'wrong' leg, and so, even if the shot had only hit the target a few feet to the left of centre, the ball ended up in the back of the net. Scotland were ahead, possibly somewhat against the run of play so far. 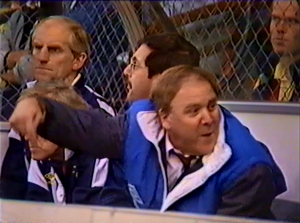 Andy Roxburgh, the Scotland manager, was sat in the stands, and he communicated with his assistants on the bench through the means of a walkie-talkie. 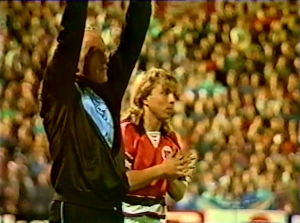 Craig Brown was Roxburgh's right hand, and he was the one leading the operations pitch side. Scotland were set up in their traditional 4-4-2, though there were a couple, at least, of interesting points about their tactics. Between the posts, experienced shot stopper Jim Leighton was Scotland's first choice, something which he'd been for a good few years already. He'd appeared five times in qualification for the 1984 European Championships, and having served Aberdeen loyally for a number of years, he'd now switched to south of the border in England, as he was plying his trade at Manchester United. 30 years of age, Leighton was among the more experienced campaigners in the Scottish side. The four man who made up the defensive line were, from right to left, Gary Gillespie, Alex McLeish, Willie Miller and Maurice Malpas. Perhaps oddly, Gillespie had not come into the national team picture until recently, as he'd made his debut the year before, and this was only his fourth cap. Clearly not a right-sided defender by trade, he was still highly capable of performing in any position in a back four. Gillespie was a towering defender, and his aerial strength would come to good use against the taller among the Norwegian players such as Bratseth and Fjørtoft, and especially when defending set-pieces. The Liverpool man would from time to time lock horns with said Fjørtoft, who was the more left-sided of the two strikers. In the centre, 33 year old Miller might not be the quickest, but he was equipped with an excellent footballing head. He was a fine reader of the game, and his positioning was vital to their defensive print. He obviously knew central defensive partner Alex McLeish well after many years of playing together at club level as well as for Scotland, and so these two were probably capable of knowing each other's whereabouts without needing much communication. McLeish appeared to have greater desire for direct confrontation with the opposition's strikers, although it is not fair to say that Miller would shirk away from such duties. On the ball, the latter was the more raffined of the two, and he'd knocked the ball forward with fine precision for Johnston's header which had assisted the opening goal. To the left in defence was Dundee United's Maurice Malpas, who was making his 21st international appearance, and who seemed a settled member of the Scottish team. He'd featured both in qualification for and in the finals of the 1986 World Cup, as well as in qualification for the 1988 European Championships. Malpas was capable of using either foot to good effect, though he was facing perhaps Norway's most energetic attacking weapon in right-sided midfielder Løken. The 26 year old Tayside man needed to be constantly alert to whatever dangers could arise from the presence of Løken. In midfield, Scotland had Celtic pair Roy Aitken and Paul McStay in the centre. The former, appearing for the 40th time in country colours, was captain for the occasion, and he was sitting slightly deeper than his enthusiastic colleague. Aitken was a great battler, someone who truly relished going into a challenge, and he would let the opposition players know he was there. McStay, six years Aitken's junior, was carrying the Scottish midfield with his industrious running. He seemed to have a terrific engine, rarely slowing down in his pressurising of opponents when Norway were in possession. He proved with his goal that he could strike the ball well, and his goalscoring ratio at international level was certainly not bad for a midfielder. To the right, there was exciting Dundee United forward Kevin Gallacher, 21 years of age, winning only his third cap. He was possibly someone who prefered to play through the centre, though he could still do a job as a wide alternative through his quick thinking and fine pace. He was certainly not without defensive responsibilities, as he needed to assist Gillespie along the right hand side inside their own half of the pitch. He would also prove a threat to Norway captain Giske, their left-back, when going forward. Opposite from Gallacher was Liverpool's utility man Steve Nicol, another player well capable of operating in various positions. This time around he'd been assigned to the left hand side of midfield, from where he was ordered to assist in-field whenever the opposition were in control of the ball. Nicol would also need to lend a helping hand to left-back Malpas, and another task of his was to prevent the Norwegian right-back, Henriksen, from making too many forward forays. This was Steve Nicol's 18th cap since his debut four years earlier in a 6-1 home thrashing of Yugoslavia. Up top, Scotland had two players who knew each other from both's respective times at Celtic Park: Brian McClair, now a team mate of Leighton's at Manchester United, was earning his eighth cap, whilst the one year older Maurice Johnston was making his 21st appearance at international level. 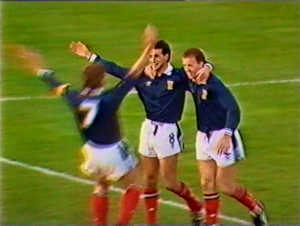 They were both goalscorers with fine domestic records, though McClair had yet to open his account for Scotland, whilst Johnston had previously struck six times in the famous dark blue shirt. In the wake of the Scottish goal, the Norwegians try not to let it influence them too much that they've fallen behind. However, despite their wish to retain dominance, they do not quite manage to reach the same level which they'd held at the start of the game. They have been knocked out of their rhythm somewhat, and it could also be that the audience go off the boil a little after McStay's goal. Norway need enthusiasm in their play, but they can't quite muster keeping the same pace as before, and so the balance of the game has shifted with the 15 minutes goal. When Sundby had been forced to come off, Norway had replaced him with youthful midfielder Ørjan Berg, yet another player from champions elect Rosenborg of Trondheim. Berg, quite small in stature, was trusted into the left hand side of midfield, and despite winning only his second cap, the 20 year old was clearly not intimidated. He showed some fine touches, he passed well, and he kept the hosts ticking along the left. Berg would look either for Brandhaug in the centre or even Løken along the right when searching for options, or he would play Fjørtoft in through the means of a low forward ball. Here was certainly someone enthusiastic, though it is difficult to say what it meant to them as a collective that they'd lost the expectedly influential Sundby. Taking over for the stricken man in the centre was Kjetil Osvold, a 27 year old left-footer who was now plying his trade with Stockholm club Djurgården. He was on his 28th cap, so Osvold was no novice at this level, but his one-footedness seemed to hamper his fluency a little: He would always need to make a turn or take an extra touch to shift the ball on to his much favoured left boot. 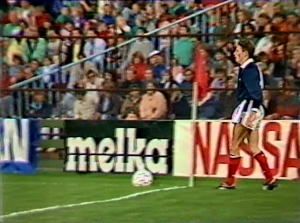 Just after the 18 minute mark, Norway make a fine foray deep into Scottish territory, and it is the first time that right full-back Hans Hermann Henriksen truly joins in coming forward. He would make it all the way into the opponents' penalty area before he'd be pegged back by Miller, who eventually turned the ball home to Leighton. Henriksen had burst into the area, attempting to reach the ball after Fjørtoft's header from Brandhaug's forward chip. The home fans want a penalty, but the Italian referee has none of it. Rightly so. The 1-0 lead seems to fit Scotland perfectly. Obviously, being a goal to the good suits any team, but the scoreline also leads to a game picture which makes them sit back and wait to catch the hosts on the counter. Scotland are a direct side, and when presented with the opportunity, they will break forward with pace. They are not without speed in their side, although this is predominantly provided through either Mo Johnston or Kevin Gallacher. There is also the occasional forward advance with the ball at his feet from Brian McClair, who at times drops back into midfield, but it must be said that while McClair is not the quickest on two feet, he much makes up for this through his excellent footballing brain. He knows when to hold on to the ball, he knows when to make a run, and he knows when to play a pass. Having McClair in a deeper role is a fine move by the Scottish management team. Norway manager Ingvar Stadheim also has his team set up in a 4-4-2 formation, and they are with the experienced Erik Thorstvedt in goal. The Stavanger born 'keeper has been plying his trade in Swedish football with Scandinavian giants IFK Gothenburg since the year before, when he'd arrived following a not so successful spell with Borussia Mönchengladbach in the West German Bundesliga. The 25 year old is a tall man with a fine reach, although there could perhaps have been some questions posed for his actions when McStay had struck home the Scottish goal. In defence, the hosts had France based Hans Hermann Henriksen at right-back. He had not featured in Stadheim's first two matches in charge, but he had come in under previous regimes and given a fine account of himself. He was a quick player who liked to come forward, although on this particular occasion he found his chances limited, much thanks to Scotland deploying Nicol to look after the full-back's forward advances. At the heart of their defence were the seasoned Bundesliga man Rune Bratseth and fledgling Bayern Munich defender Erland Johnsen. Bratseth, an elegant, tall central defender was capable of operating both a libero role and in a more conventional central defensive position. 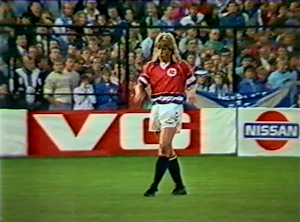 The Norwegians were seen with more or less a square back four, although early on 21 year old Johnsen, making his ninth international appearance, could be seen advancing across the halfway line on a couple of occasions. Physiologically, he did carry something of a resemblance to famous Soviet Union central defender Oleg Kuznetsov, and here he was even seen playing like him: transporting the ball in forward direction. Johnsen was compact, and also solid in the air, but far from as dominant as his colleague. Bratseth was clearly the player they sought for whenever they had attacking set-pieces, and he would cause some serious stir in the Scottish defence. Left-back in the Norwegian team was their captain Anders Giske. As the four man defensive line was made up entirely of players working abroad, Giske was one of three earning his money in the West German Bundesliga, featuring for Nuremberg. A typical no-nonsense defender, he had a fine asset in his left foot, and though a full-back on this occasion, he was also capable of playing at the heart of the defence. In midfield, the hosts had started with Rosenborg man Sverre Brandhaug, alongside Greece based Tom Sundby. 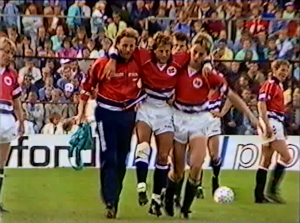 As the latter had had to leave the field early, on had come another Rosenborg player in Ørjan Berg. Whilst Brandhaug was something of a playmaker and probably operating as a 'central right' midfielder, he would have Kjetil Osvold immediately to his left in the centre of the pitch. Neither player seemed to be equipped with great physical attributes, and they had tough opponents in Aitken and McStay. Still, on the ball, they were both sound, and a lot of responsibility seemed to rest on Brandhaug's shoulders when in open play, whilst Osvold attended to a lot of set-pieces, in particular corner kicks. As the left-sided midfield option was substitute Berg, whilst the exciting 'Kalle' Løken was one of their main attacking threats from his right-sided position. Løken had speed, awareness and fine delievery as his greatest assets. The two strikers were both based domestically, with Lillestrøm and Rosenborg respectively: Jan Åge Fjørtoft, a 21 year old making his seventh appearance at this level, and Gøran Sørloth, five years older and now on 13 caps. Neither were particularly pacey, but Fjørtoft had an aura of unpredictability about him. He was also known for being in the right spot at the right time, and so he was dubbed an up and coming goalgetter; a poacher. Sørloth's strengths laid more in the fact that he worked well with a man in his back, shielding it from his opponent, and laying it off for his team mates. With his face towards goal, he did not appear to be a major threat. Despite a relatively modest size, he was equipped with a fine physique, and so he would challenge the Scottish stoppers well, often coming in contact with Miller. 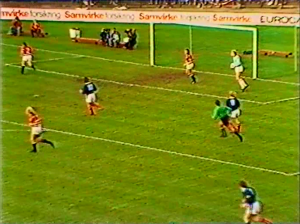 There is a sole first half booking, and on 28 minutes it went to Scotland captain Roy Aitken for a foul on Berg. It was not that the tackle in itself was particularly nasty, but the referee indicated that he booked the Scotland number 7 for persistent fouling: It had been Aitken's third foul warranting a free-kick. Berg had earlier been on the receiving end of a heavier challenge from the Celtic ace, so the accumulation of fouls would finally count in Aitken's disfavour. The remainder of the half does not provide a whole lot in terms of spectacle for the audience; it is a bit of a scrappy affair. Neither side is able to offer creativity, something which is particularly disappointing from a Norwegian point of view, given the fact that they are trailing the visitors by a goal to nil. The hosts do show some fine combinations in midfield, but their approach usually comes to a halt once they arrive on the fringes of the penalty area, where the Scottish defence mops up whatever is thrown at them. Miller goes in hard on Sørloth on a couple of occasions, and one such free-kick sets Osvold up for a shooting opportunity from around 30 yards. However, the fleet-footed midfielder's attempt is skied, and there's a greater threat, although limited, when central defender Johnsen steals in on the act following an unfair McLeish challenge on Fjørtoft, to set the hosts up for yet another attempt on goal. It had possibly been expected that Osvold would lift the ball into the area from around 35 yards, but Johnsen had other ideas, as he decided to power the ball goalwards. However, his low effort was no match for Leighton, who gathered comfortably by his left hand post. The half was approaching its final moments when the hosts struck: Norway would equalize in slightly unfashionable circumstances. They'd won a free-kick some 30 yards out, and again it had been Osvold lifting the ball into the box. It was headed away by Aitken, but the midfielder had failed to get sufficient air behind his clearance, and so it fell to Fjørtoft, whose opportunism saw him head home the equalizer: He'd steered his header over Leighton after he'd reacted quickly to Aitken's header clear. Clever thinking, although the Scots tried to claim that Johnsen was offside and impeding the goalkeeper on the goalline as the ball went in. Agnolin would not listen, and the goal stood. 1-1. Norway had a precious goal just on the stroke of half time. There were no less than three minutes of time added on for the injury to Sundby at the end of the half, but neither side were able to come up with something as the crowd let their appreciation show through their demonstration of the Mexican wave. 1-1, and all to play for after the break. The opening 45 minutes had been an exciting affair, at least during the first 30 minutes, and then there had been the dramatic ending with the late equalizer. As the teams came out on to the pitch for the start of the second half, there did not appear to have been made any half-time substitutions. As the visitors had initiated the match, it was now Norway's strike duo of Fjørtoft and Sørloth who would make sure to get the final period going. As the first half had progressed, the Scottish had contained the Norwegians fairly well, albeit they had had some problems along their defensive flanks, perhaps in particular when the hosts decided to bring right-sided midfielder Løken into action. He would challenge Malpas for speed, and his idea was always to gain advantage on the full-back and aim a ball into the centre for either of the strikers. Down the opposite flank, the Norwegian left, Berg had been more of an inverted wide player during the opening 45 minutes, and so Gillespie, Scotland's right-back on the occasion, had not been challenged for speed. Still, the two Scottish wide midfielders, Gallacher along the right and Nicol to the left, had contributed well defensively during the opening half, assisting each their full-back aptly, and such limiting the Norwegian forays down the flanks after all, even if Løken had had it his way from time to time. The initial phase of the second half again sees plenty of pace and intensity, although individual technical ability's not always quite on par with the tempo of the game. It does certainly appear that the visitors have changed their outline, as their midfield clearly holds a diamond shape by now. This had meant some shuffling about for a few players, most notably with right-sided alternative Gallacher moving into a more central, forward position alongside Johnston, while first half attacker McClair dropped back somewhat to feature as the spearhead in midfield. 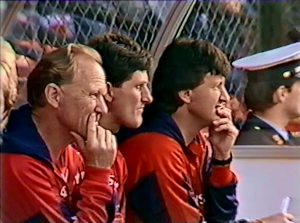 Sitting behind him in something of a central two were Nicol, who had moved in field from his wide left position during the first half, and McStay, while Aitken now was working just in front of the two central defenders as the midfield anchor man. These tactics would seem to demand plenty more from the Scottish full-backs, as they now would have to provide the width coming across the halfway line. This was something which would perhaps seem quite normal to Malpas, but how would Gillespie, usually a central defender, cope? There's a few interesting challenges all over the pitch in the first few minutes of the second half, and there's some early treatment for Mo Johnston after a tough aerial challenge from Erland Johnsen. Big Alex McLeish at the heart of the Scottish defence is also someone who usually takes no prisoners, and this is exactly what wily Norway striker Jan Åge Fjørtoft faces four minutes in, when he goes to ground after a challenge just inside the Scottish half. There's also a small spat between Fjørtoft and Roy Aitken, as the latter attempts to speed up Fjørtoft's getting up following that challenge. This will later climax into a bit of a poorly timed challenge from the home striker on the Scottish midfield hard man, although to Aitken's credit he does not make much of it. However, on 55 minutes, Aitken can perhaps consider himself slightly fortunate to have escaped a second yellow following a rough challenge on Norway's Kjetil Osvold. These little battles add a bit of an edge to the game, although it never turns nasty, and the players are usually accepting their opponent's apology, like Osvold, when he shook hands with Aitken following that duel. Perhaps had it been the visitors looking the more nimble going forward, and certainly unexpectedly had it been right-back Gillespie who had got on the end of the first purposeful attack since the half-time break. Six minutes in, the advancing Gillespie had played Johnston a ball to the right inside the Norwegian penalty area, and as the full-back had continued his forward run, he'd received the ball back as he'd positioned himself just to the right of goal. Gillespie had attempted a side-footed finish, although it had cleared the Norwegians' bar by a couple of yards, and he'd even been adjudged offside. One could not fault Gillespie for the effort, though, and perhaps had it come as something of a surprise to the hosts that the big defender was also quite capable of causing trouble when the ball was played along the deck? Not long in the wake of Scotland captain Aitken's tough challenge on Osvold, would the visitors decide to withdraw the Celtic player and replace him with Ian Durrant. The Rangers man, aged 21, was considered a more attacking kind of midfielder than the player whom he had replaced, so what would this mean to the outlook of the Scottish midfield? Durrant had made his international debut during a 2-0 home friendly win against Hungary a year earlier. The Scotland chiefs were surely worried that their skipper would go on and 'claim' a second booking, and so boldly took him off before any such damage could happen. This meant that central defender Willie Miller took over the captaincy. Scotland strike again on 63 minutes. The goal comes about after they've managed to win back possession high in the field after a right wing corner had originally been wasted. Gillespie, who was having a good game so far, all of a sudden found himself in a wide left position, and he did tremendously in transporting the ball inside and towards the centre of the penalty area. He rode a couple of challenges, and resembled more a skillful attacking player than an arch-typical British central defender. He played in McClair, though the attacking midfielder found his path to goal blocked, and so he in turn fed Gallacher to his right. The forward prodded the ball goalwards with the tip of his boot, but it was blocked by Bratseth, and the ball ricochetted into the path of Osvold, who could not react in time to clear it. Coming off his leg, it fell into the path of Johnston, who struck opportunistically left-footed eight yards out and high into the roof of the net, thus rendering goalkeeper Thorstvedt with no chance to save. Norway 1, Scotland 2. The hosts now had a big task on their hand in order to restore parity. The home side does not manage to put Scotland 'keeper Leighton to the test, and arriving at the halfway stage in the second half, they will need to up their effort if they are to rescue anything from the game. Scotland are so far comfortably protecting their lead, and they owe plenty to their central defensive pair of McLeish and Miller, who are keeping the hosts' front two, Sørloth and Fjørtoft, quiet. To the left in the Norwegian midfield, Berg had done well in the opening half since replacing Sundby early, but he did not get on the ball much so far in the second period. The same was certainly the case with Løken opposite, so it seemed that the Scottish change in tactics had made sure to stifle the Norwegian wide threats. Norway had looked their best when they had brought their big defenders forward, but reaching the midway point in the second half, neither Bratseth nor Johnsen had had such opportunities since during the first 45 minutes. The visitors might have been comfortable at this stage, but they could surely not afford to get complacent; they knew there was plenty of time still to concede. 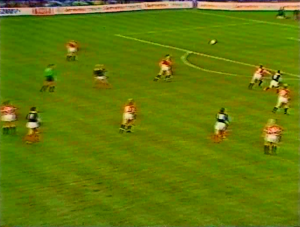 Since Durrant had come on, it had looked like McClair had come even deeper, and it almost resembled a central midfield three with those two and Nicol, working slightly to their left, and with McStay appearing just behind them. However, the scorer of the opening goal was not sitting as deep as his team mate from club football Aitken had done before leaving the pitch. Scotland would look to play their strikers in, and in Gallacher they had a truly speedy striker who would challenge the Norwegian defence for pace, although he would often find his match in the blisteringly quick Bratseth. Both Gallacher and Johnston moved into the channels, and this front two appeared a greater threat to the hosts than their attack line had done before the half-time break. 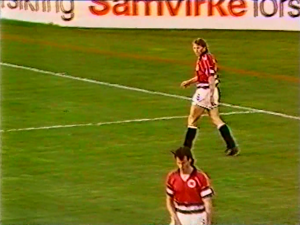 Also, McClair, who'd dropped deep, had the ability to bring the ball forward from midfield and search out either attacker, and this also caused the Norwegians some trouble, as they had no natural defensive midfielder in their team to pick him up. Osvold was the one of their two central midfielders who seemed to be doing the greater level of defensive work. Some greater promise finally appeared from the hosts as they carved out a couple of opportunities beyond the 70 minute mark. Firstly, Nicol unnecessarily tugged Fjørtoft back just outside the Scottish penalty area as a high ball came forward from the Norwegian left hand side, and the ensuing free-kick gave Osvold a chance to aim at goal from 20 yards. It had seemed the perfect position for a left-footed shooter to bend an attempt above the defensive wall and beneath the crossbar, but the midfield man could not avoid the wall of Scottish players. A couple of minutes later, the hosts went closer as they'd finally been able to bring Bratseth forward for a set-piece inside the Scottish half. He'd battled aerially with Gillespie, and though he'd needed to retrieve the ball wide in the area, he'd managed to feed Løken, who in turn had got round McClair to put a cross into the box for the first time in the second half. Norway captain Giske got at the end of it, although his headed effort went just wide to the right of Leighton's post via the ground. Had the left-back hit the target, it would've been a difficult task for the 'keeper to save. Can these opportunities give some needed impetus, though? With the clock ticking in favour of Scotland, the game seems to open up somewhat, which, at this stage, perhaps should not be surprising. The Scottish are probably dropping deeper in protection of their lead, and whether or not this is intentional, it provides the Norwegians the opportunity to bring more ammunition to their forward forays. However, it also leaves them vulnerable to Scottish counters, and on one such occasion there's a stinging left-footed shot from Gallacher just over, via full-back Henriksen, from just outside the area. A minute later, and about a quarter of an hour from full time, it is left-back Malpas who has come forward in order to have a pop from an angle outside the penalty area, but he does not connect very well with his right foot, and the ball rolls unceremoniously far wide to the left of goal. Down the other end of the pitch, Norway striker Sørloth has a rare sight of goal inside the area, and he attempts a half volley with McLeish breathing down his neck, although he gets way too much under it, and it never troubles Leighton. Ten minutes from time, after a Norway free-kick just outside the centre circle in the Scottish half of the pitch, there's another opportunity for captain Giske when he reacts first to a ball which drops to him to the left inside the Scottish penalty area. Bratseth had won in the air against Gillespie from Brandhaug's ball into the box, but the home left-back failed to aim his effort at target. The referee awarded a goal kick, even if it had clearly taken a touch off Miller on its way behind. It appears that there's to be no final push from the Norwegians, who mostly are dallying about in midfield, playing little passes between themselves, with the occasional attempt, predominantly from Brandhaug, to thread a ball through for either striker, usually the more flexible Fjørtoft. The Scottish defend calmly and in numbers; they are rarely stretched or put to the test. There is a surprise forward appearance for central defender Johnsen, who wins a corner off Nicol from a right wing position. It is by this time that the hosts decide to throw their final dice, replacing the man who had made his entrance as early as the fourth minute, when he himself had come on for the stricken Sundby: Off goes the energetic Berg in order to be replaced by someone sporting an almost equally impressive mane in little striker Jahn-Ivar 'Mini' Jakobsen. This is Rosenborg player number five to appear for the evening, as Jakobsen earns his second cap, just over a month after his debut during the 1-1 draw with Bulgaria. Despite their apparent lack of urgency, the Norwegians do manage to carve out a couple of opportunities towards the very end, and no chance is bigger than the one that substitute Jakobsen is at the end of deep into injury time. He had been a straight swap for Berg along the left hand side, and feeding off a finely threaded through ball from his Rosenborg team mate Brandhaug, he has a shooting opportunity to the left in the area, although the angle does not favour him a great deal. He ends up scooping his left-footed attempt well over the bar, and with it went Norway's final chance of an equalizer. With two and a half minute of additional time having been played, the solid Italian referee blew his whistle one final time to signal the end of the clash. The Scottish players put their arms up to celebrate two invaluable away points from their opening fixture. Norway are rocked by a sad injury to midfielder Sundby within the first minute of the game, although they don't appear to let it mute them as they attack the visitors with pace and intent. Løken is a threat down the right hand side, and they have a big presence at set-pieces in central defender Bratseth. 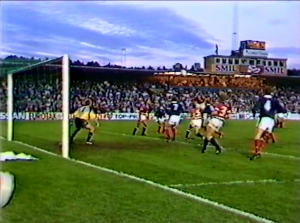 However, the Scottish are about to level up the balance of play as they strike home through impressive midfielder McStay, and though the first half continues at decent pace through to the half hour mark, it has dropped in quality by the time when Norway equalize right before the break through an opportunistic header from Fjørtoft. 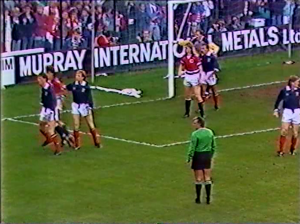 The Scottish change their midfield formation for the second half, possibly to try and cut off the leading supply lines for Løken, and they are largely in control, conjuring up what proves to be the winning goal from the lively Johnston 17 minutes into the half. No urgency is seen in the home side's attempt to muster another leveller, and though substitute Jakobsen is through right at the death, he fails to hit the target from something of an angle. Job well done, Scotland, and a massive two points from an away fixture. Norway go to France in need of a point or two to get back on track.